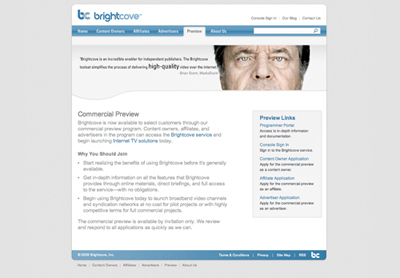 We are excited to announce that we have added a variety of new features to the Brightcove website. As we emerge from our commercial preview to general availability, we will be frequently updating the website with news and announcements, so make sure to check back often. We are also showcasing a number of new publishers who are currently launching Internet TV businesses using Brightcove services, such as Brian Storm and his broadband photojournalism site MediaStorm, and Viacom's MTV Network's O'Grady on The N.